ON THE day a race stopped the nation, it was agriculture that won big in the Queensland election campaign. The LNP promised farmers an electricity rebate as Labor promised money for research and wild-dog fences. But farmers groups want more to be done to help the state's primary producers. LNP leader Tim Nicholls said farmers and irrigators struggled to pay power bills associated with running their businesses. Yesterday he promised a $1400 Food and Fibre Transition Payment for up to three years for farmers and irrigators on obsolete and transitional agricultural tariffs worth about $75 million. "For smaller farms, they can use it to pay the power bill,” he said. "For people who want to invest in smart meters so they can monitor and control their power use, they can invest in those. Premier Annastacia Palaszczuk visited the Condamine electorate, outside Toowoomba, where she announced a $29million plan to increase agricultural production. "Since we were elected in 2015, the value of agricultural production has soared nearly 40 per cent to almost $20 billion - despite a debilitating record drought - and we are determined to ensure that the agriculture, fisheries and forestry sectors have the backing they need from government to continue to grow,” she said. 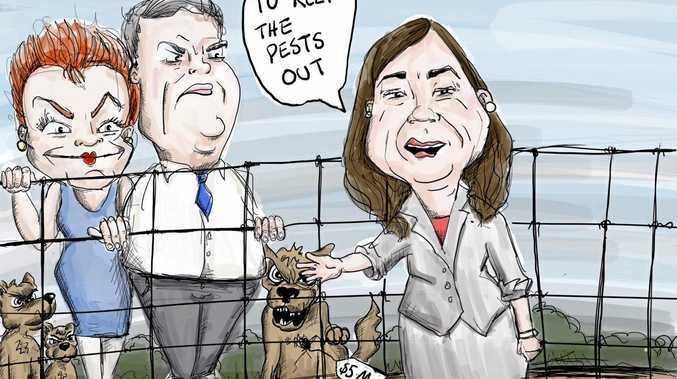 Ms Palaszczuk also announced a $5 million, two-year, plan for wild-dog fences in western Queensland. Labor Energy Minister Mark Bailey said the government's Energy Saver Plus program would provide better outcomes for farmers than the LNP's announcement. "The ESP has won support from growers across the state, and has been endorsed by the Queensland Farmers Federation,” he said. Mr Bailey said the program provided free energy audits for farmers and up to $20,000 to help them implement recommendations. But Queensland Farmers Federation has called for both major parties to do more to help primary producers across the state. QFF president Stuart Armitage welcomed the LNP's proposal but said more needed to be done. "It is clear the LNP are listening to farmers, however, the proposed tariff rebates will not compensate for a lack of suitable tariffs in 2020, where some farmers will be facing electricity price increases of 50 to 100 per cent,” he said. "A commitment to either retain the existing agricultural tariffs or develop new appropriate tariffs is needed. "Systemic policy failures have created a situation where energy affordability is now critical to the profitably, competitiveness and viability of intensive farm businesses. "Fixing the 'energy crisis' will require a holistic and strategic approach. Similarly, AgForce general president Grant Maudsley said Labor's agricultural policies had positives but needed to do more to provide farmers an important boost.